Cato is the chief proponent of cloud-based, infrastructure delivery. The cloud’s elasticity, scalability, affordability, and reach directly addresses many major challenges for IT. Eliminating networking and security appliances eliminates the cost and complexity of buying, sizing, upgrading, patching and maintaining those appliances as network loads grow. 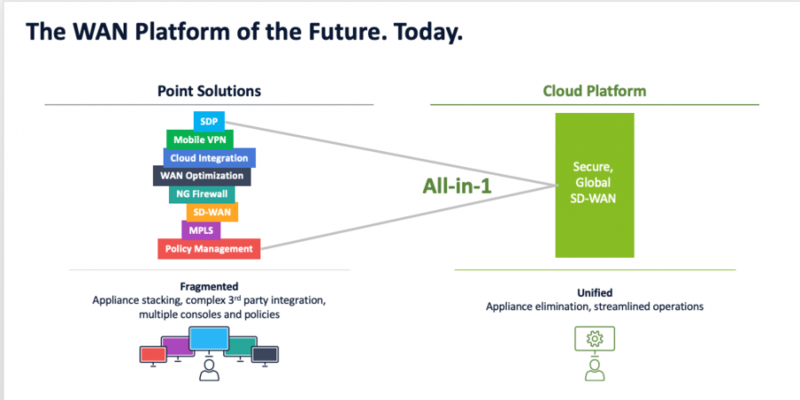 Moving security and networking into the cloud dramatically simplifies IT, allowing a single, easy to manage, set of networking and security policies for the entire company. Cato Cloud is a global, cloud-based software platform that connects and secures a company’s locations, cloud resources, and mobile users. The Cato Cloud Network is the largest, independent cloud-based SD-WAN network in the world with more than 40 points-of-presence (PoPs) around the globe. Cato Security Services are a fully managed suite of enterprise-grade and agile network security capabilities, directly built into the cloud network. Current services include a next-gen firewall, Secure Web Gateway, Advanced Threat Prevention, cloud and mobile access protection, and network forensics. More than 200 enterprises with thousands of global locations, hundreds of cloud instances, and thousands of mobile users rely on Cato Cloud. Those enterprises come in all sizes and industries. Enterprises with more than 1,000 locations, mid-sized enterprises connecting and securing dozens of locations around the globe, and companies with thousands of mobile users — all depend on Cato Cloud every day. You can see their testimonials on Gartner PeerInsights and our website. To learn more about how Cato’s vision is transforming the industry visit www.catonetworks.com or email us at press@catonetworks.com.